YouTube Channel - Click Here! Welcome! Pearls of Pella is run by a wild-hearted, dreamy, nerdy cat lady, who sometimes makes art through drawing or writing and occasionally finds herself sitting in an uncomfortable position playing computer games and drinking cold afternoon caffeine beverages. Enjoy your stay! Today is Thursday, the fourth day of my vegan challenge. I know I haven't been consistent in updating every day, but I have come to realise I picked a quite unsuitable week to start my challenge at. Exam week is here already, with the first test, social studies, behind! But for this post,I have quick text pieces and a few phone-quality pictures for you, and some thoughts about it all. If you missed the first day, you can check it out here! So it's officially day 4 of my vegan challenge, and I feel a little different in my body than on the first day. On day 2 I felt - and today continue to feel - more energy going through my system, and I feel vitalised and content for eating plant-based foods and cutting off those sugars and dairy I've been promising myself to stop indulging so much. 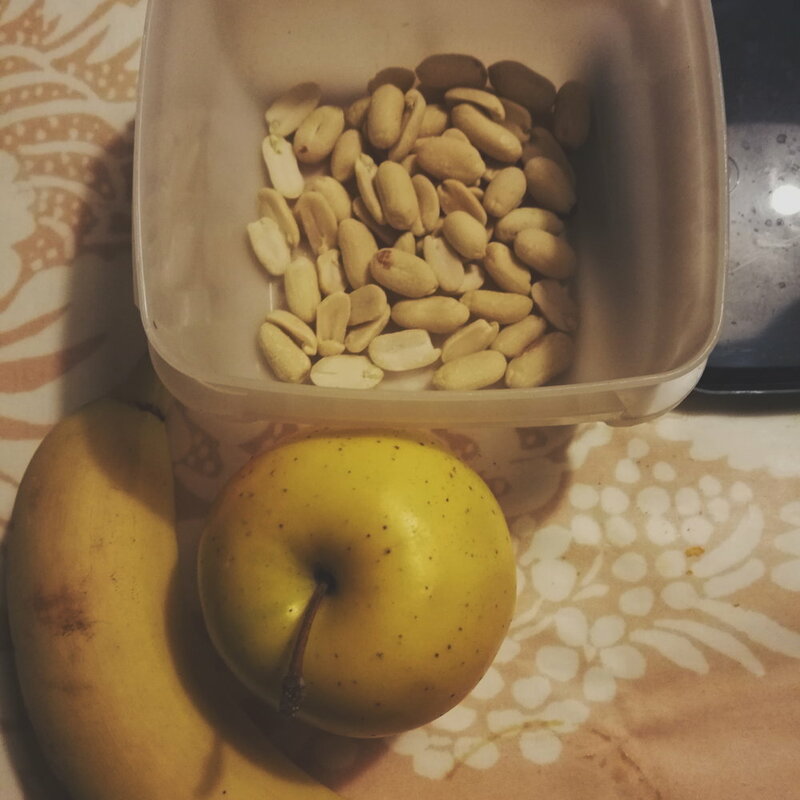 I've also tried a lot of new things, such as eating only fruits and nuts for lunch (like yesterday, on the preliminary test for the Finnish matriculation examinations, oops) which gave me surprisingly a lot of extra energy to sit for those 5+ hours and "practice" writing. But, I also had my first vegan sausage on Tuesday - more on that below. Let's get started with the three days that have passed! Introducing the power juice I'm having every morning! Except for those days my stomach is acting up. This drink contains the juice of a half lemon, a glass of regular water, a tablespoon of apple cider vinegar, and turmeric and cayenne pepper, a half teaspoon of each. It will give you energy for the day, definitely wake you up, and get your metabolism boosted in the progress. That's why I don't recommend it to those with an upset stomach, because it might just enhance the chaos in your system. Other than those days I don't feel well in my tummy, I enj-- no, I can't say I enjoy it, because it tastes HORRIBLE, but let's say I drink this and feel better for the day. Even if the day was a Monday. We had risotto at school, which I must admit I've probably never tried that at school. With it I had some salad and pasta with... black beans? And for dinner Mum made us wok, with a separate pan for my vegetables - and vegan sausage. Yep. You read right. Usually sausage is the most meat-containing food I ever get near me, and now I can have even more delicious vegan sausage if I ever want to be part of a grill party! And it tastes even better than most sausages I have eaten, so that's a huge bonus! I don't have a picture of it, but I'm sure you'll be seeing it at some point here! In the morning I had a bit more time on my hands, so I made hummus toast, the most basic meal of this whole challenge have I come to realise. But it's just so good! When I planned my vegan meals for each day I had actually wanted to have each day different, but versatile veganism for the first time is bound to be an experiment with improvisations, isn't it? I had the preliminary test in Finnish that day so I needed to pack my own snacks, since that day the school lunch wasn't vegan. I'm glad I did - everything was consumed! I also bought coffee with iKaffe oat milk and a small container of fruit juice from the school cafeteria, which also was gone when I left the test. It was already 4:15 P.M. when the school day ended, and I thought I'd combine the afternoon snack with dinner. I went to the cafe Picnic and bought a vegan baguette with lettuce, cashew nuts, guacamole and tomato, and ate it at home later while doing last minute social studies assignments. And for the evening I had this delicious new invention: a mashed banana with almond butter and cinnamon. It was SO DELICIOUS oh my god. Like a dessert, like heaven, that's all I can say about it! Today I woke up at a very strange time, and couldn't sleep but until I actually had to wake up. So what did I do? Had breakfast, of course! Food literally and figuratively gives me life. All that was left of the hummus went to a gluten-free toast, and I'm now out of my favourite food (send help). Then I snooze-rested (resting and snoozing the alarm every 5 mins) for about 20 minutes, after which I only drank the remains of my morning coffee before my father picked me up so I could get to school as it was the most awful weather out there. I had my social studies test, which went well enough for me to be satisfied. I had had my breakfast several hours earlier so I was definitely getting hungry, so I headed to Helsinki to (enjoy the relaxing bus ride and) fetch some lunch. I ended up going to the grocery shop to assemble my own vegan salad from the salad bar. 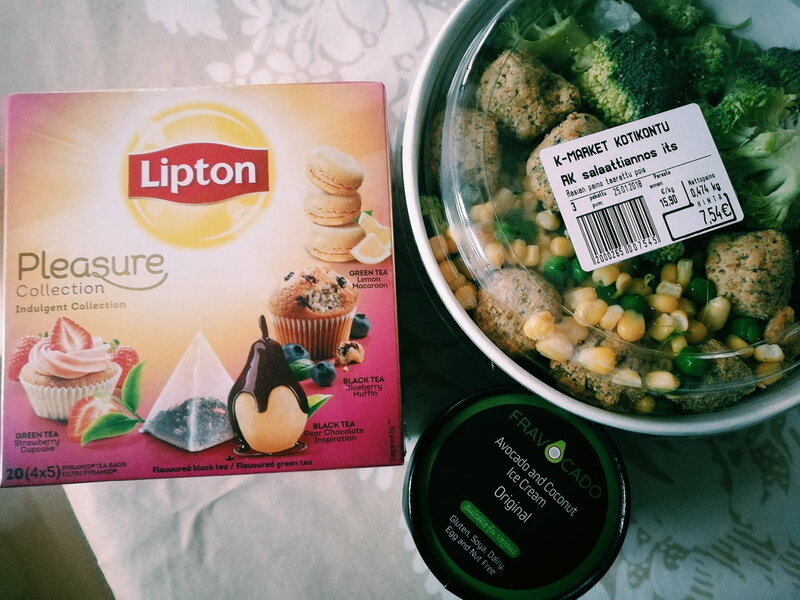 In the salad I included iceberg lettuce, broccoli, corn, peas, cucumber cubes and falafel balls. I also added in a little garlic olive oil as a dressing when I came home. I'm currently eating it here in my bed, while finishing this blog post, and I must say, making my own salad from a salad bar's ingredients has been the best decision I've made in a while! Or at least I think so. Also what I found in the grocery shop, which will be my Saturday snack: Fravocado's avocado and coconut ice cream! What a treat! I can't wait to try it in a few days... I sincerely hope so, that it'd be a few days, I don't want to be eating it outside the weekend! While waiting for the bus home I had an early afternoon coffee drink; this one's the salted caramel latte with oat milk. Again, oat milk - and vegan food in general - tastes so good, I don't know how I'm going to introduce food from animal origin back into my life. Maybe I'll skip the whole meat business, forget the bacon and beef and gnaw on my asparagus. Haha, just kidding. With all the vegan delicacies, I'll be eating like a royalty. So far the vegan diet has suited me surprisingly well. I still need to reduce my intake on gluten, but otherwise I think I've been living as healthy as I could ever become. Except for today, when I had a coconut ball for dessert after my salad. Ow. My stomach doesn't like sweets any more. But isn't that just a good thing? Coming only on day 4 I've realised so many things about eating well, and I think I'm beginning to find that balance I need in my eating habits. When you're a vegan you don't have many options to eat junk food, and I don't even crave a hamburger or bacon any longer. It was the same as with the low-carb diet I practised in the summer, I simply stopped craving carbs and unhealthy foods altogether. Leaning towards the vegan side has been an eye-opener and a huge blessing from the Universe, and I can't wait to see what the remaining 3 (3??!!?!?!?) days will bring! Hope to see you then! Spring Shopping + The Blog's Very 1st Birthday!